iSCSI Extensions for RDMA (iSER) is a network protocol that extends iSCSI to use RDMA. iSER permits data to be transferred directly into and out of remote SCSI computer memory buffers over InfiniBand and Ethernet networks without intermediate data copies by using RDMA. RDMA is supported on InfiniBand networks, by RoCE on "lossless" Ethernet (DCB) networks, and by iWARP enhanced TOE NICs over standard Ethernet networks. The InfiniBand iSER fabric module for the LinuxIO (ib_sert.ko, see Linux kernel driver database) was implemented as a joint development effort between Datera, Inc. and Mellanox, and released with the Linux kernel 3.10 on June 30, 2013 (2013-06-30). An RDMA consortium was announced on May 31, 2002 with a goal of product implementations by 2003. The consortium released their proposal in July, 2003. The protocol specifications were published as drafts in September 2004 in the Internet Engineering Task Force and issued as RFCs in October 2007. The OpenIB Alliance was renamed in 2007 to be the OpenFabrics Alliance, and then released an open source software package. 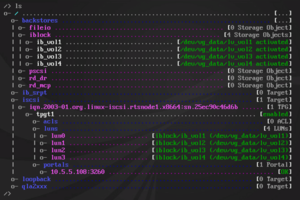 targetcli from Datera, Inc. is used to configure iSER targets. targetcli aggregates LIO service modules via a core library, and exports them through an API, to provide a unified single-node SAN configuration shell, independently of the underlying fabric(s). iSER uses the existing iSCSI target control plane with a special iSER enable bit per network portal context. First, update the rtslib, targetcli and lio-utils packages to the latest revisions. Then, run targetcli as root from the command prompt of the underlying OS shell. For iSER Network Portals, targetcli automatically uses the iSCSI default port number of '3260', thereby forming a valid new iSER Endpoint. The iSER Endpoint makes the TPG discoverable by iSER initiators. This creates an iSER Node ACL with a mapped LUN0. Node ACLs allow mappings of actual LUN IDs onto arbitrary Mapped_LUN IDs, which are the LUN IDs presented to initiators. These mappings can match preferred LUN IDs for particular initiators, so for instance, a LUN1 can be mapped onto Mapped_LUN0 to make LUN1 appear as iSER LUN0 on the initiator. Usually, LUNs are identically mapped, however. The iSER Endpoint is now ready for secure logins from the specified iSER initiator. The mutual_userid (login name) and mutual_password (initiatir secret) for the initiator. Parameter mutual_userid is now 'iqn.2003-01.org.linux-iscsi.san01.x8664:sn.05135a0e4a11'. Optionally, the iSER protocol can also control the visibility of iSER targets for discovery by iSER initiators. Only iSER initiators that can authenticate themselves with a user id of "mytargetuid" and a password of "mytargetsecret" can now discover this iSER target. Only iSER initiators that can authenticate themselves with a user id of "mytargetuid" and a password of "mytargetsecret" can now discover this iSER target, and conversely, the iSER target can only discover iSER initiators that can authenticate themselves with a user id of "mymutualuid" and a password of "mymutualsecret". Without saveconfig, the Linux SCSI Target configuration will be lost upon rebooting or unloading the target service, as the target configuration will revert back to the last saved one. In particular, iSER uses the iSCSI spec file, and does not require a seperate spec file. ↑ Linus Torvalds (2013-6-30). "Linux 3.10". marc.org. ↑ "Open Consortium Developing Specifications for Remote Direct Memory Access Over TCP/IP Networks". press release. 2002-05-31. ↑ Mike Ko, et al. (July 2003). "iSCSI Extensions for RDMA Specification (Version 1.0)". ↑ M. Ko et al. (October 2007). "Internet Small Computer System Interface (iSCSI) Extensions for Remote Direct Memory Access (RDMA)". RFC 5046. ↑ M. Chadalapaka et al. (October 2007). "DA: Datamover Architecture for the Internet Small Computer System Interface (iSCSI)". RFC 5047. ↑ "OpenFabrics Alliance". official web site. This page was last modified on 7 August 2015, at 02:39.